Over the past 24 hours, major news has come out that have been in the works for at least a couple of years (possibly longer). TBS President went ahead and announced their plans to create a Sasuke World Cup. He didn't mention timeline or format, however he did confirm that it will be held at Midoriyama Studios (which is not a mountain..) in Japan and run by TBS. As more information comes out I'll post whatever is publicly posted. There's a LOT going on in the background and this has changed a few times. This will be an international event held and hosted by TBS at the same site that Sasuke normally records. They've learned the lessons from the previous failed attempts (we are looking at you ASEAN Open Cup) and after seeing the USA do a much smaller version on American soil, they are now confident that people will be interested in their own version in Japan shifting the focus back to the original show which is still very much in existence. I'm excited because they are tying more things to Sasuke Japan giving it more relevance and importance. Should this work, Sasuke Japan (the numbered series) will continue for many years to come. This also will give an outlet to the foreigners that up to now have been either locked out or severely cut from the Sasuke Rising era of the original show back in Japan. Speaking of which.. yeah.. so.. right. I'm laughing so hard right now. Here I am being super careful not to reveal the taping date and they announce it worldwide on their website! ahahahahhaaha Now ya'll who contributed to the IndieGogo know when I'll be in Japan! I can now use my now 7 year old video!! SO EXCITED! SO EXCITED! ONE MONTH TO GO! That's cool though they will have a lottery audience drawing! I hope it works and it brings excitement to the show! I gave them the suggestion a few years back and it worked well with the early airing of Sasuke 30 (that also had a lottery). I am sure people will LOVE being able to see it live as it tapes! So if you live/work in Japan, it can't hurt to send in your information to be invited to watch! Remember that this is a lottery, it is ONLY for audience participation (since Auditions are complete) and you pay for your own way. 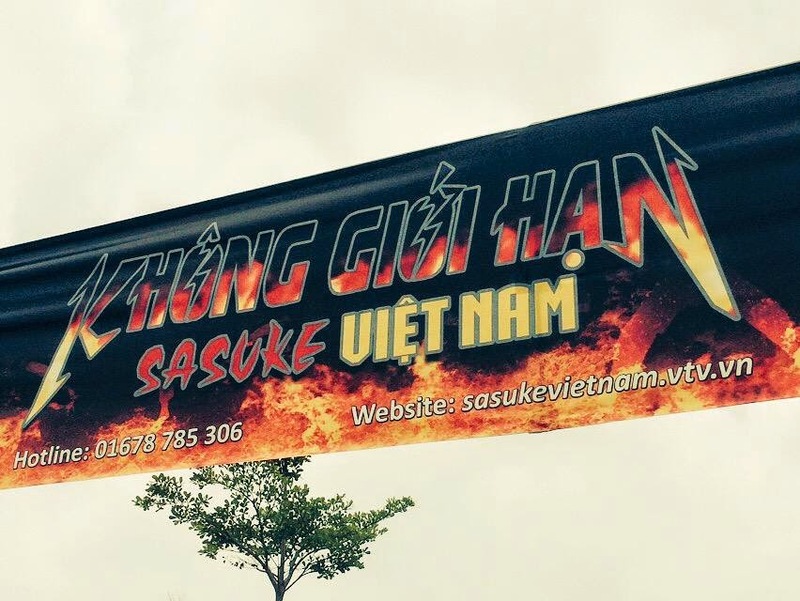 Oh yeah.. Sasuke Vietnam almost got reckt! I kid you not.. a couple of days ago I read about Sasuke Director Masato Inui 乾雅人 running for cover because they were having storms. I knew they were going to have thunderstorms.. but I couldn't believe what happened. A TORNADO HIT THEM! 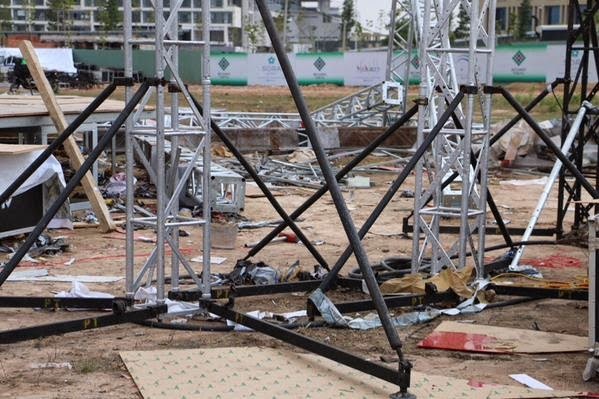 They got super lucky because the only things that were damaged were announcer booths, and light riggings. The course itself was undamaged. Seems where the tornado touched down was just to the side of the course, so outside of litterer debris, they don't have to rebuild the course. If you notice in the left in this photo, the Jumping Spider is far in the distance. 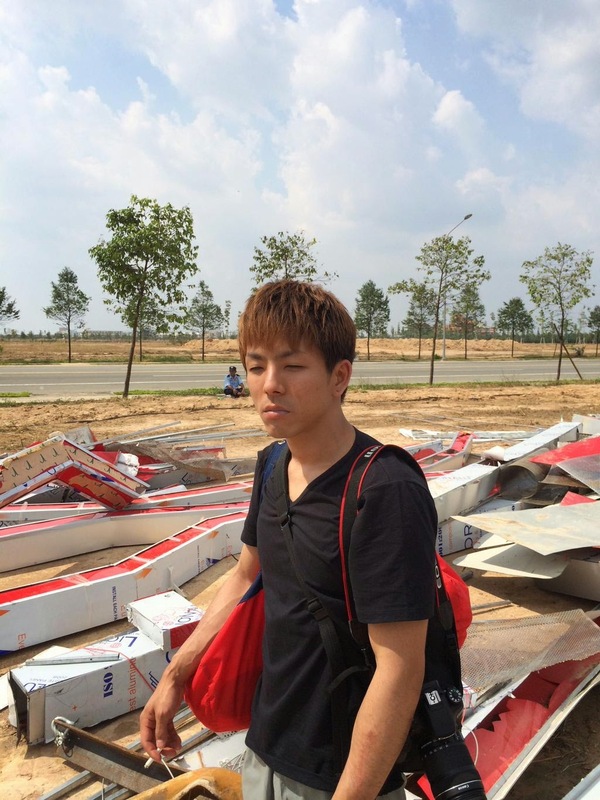 Inui mentioned that they do have to rebuild a 7 meter (about 23 foot) steel light rig that was blow off by the tornado from it's original position and mangled on the ground. I'm assuming that this is what we are looking at. So while the production staff will have to move to another location while they film, it could have been a whole lot worse. They are obviously shaken up. 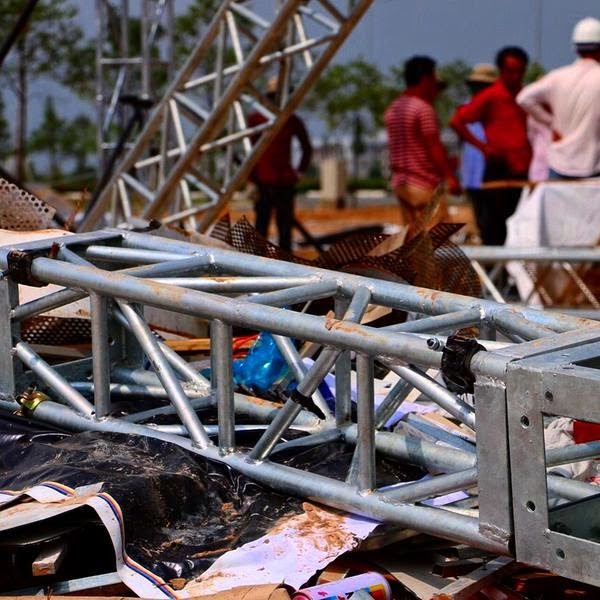 The power of a tornado that ripped a 7 meter/23 foot metal rig and turned it into bent mess way off from it's original position could have killed them. Especially considering that everyone was on set that day. So needless to say, Inui was right that they had a close call and are lucky to be alive. 24 hours later Ryo started to post photos of the course under the lights. 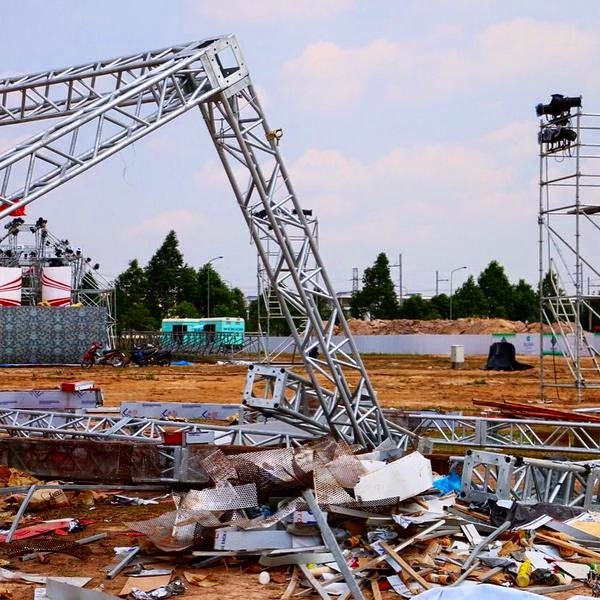 From a production standpoint, the show must go on. 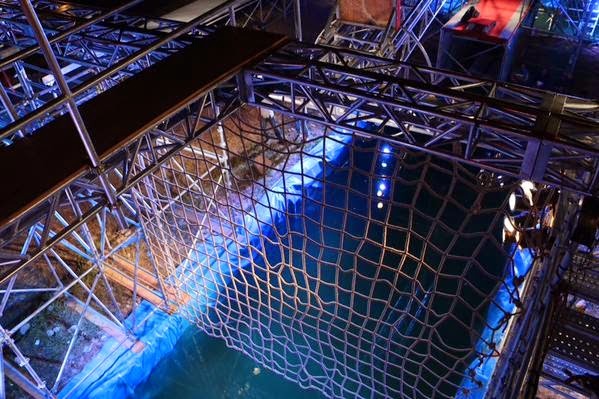 The final auditions were yesterday and today with production for stage 1 officially starting on Friday. Vietnam floated the idea of doing a Japan vs. event last minute but everyone is balking at it because it's sooo close to Sasuke 31 that they didn't want to risk injury. Now that we know the date, they are right.. with a month to go until taping of Sasuke 31 in Japan they can't afford to do it. I hope they don't get any more tornados and the show can continue taping without incident. (facepalms about how behind I am on news) Considering that Toho has done Mothra reboots sporadically and that Mothra's probably one of the best-known of the giant monsters (I would put her up with Gamera, both right behind Godzilla, IMHO), I would hope getting a Mothra joke isn't age-dependent... Shoot, Crunchyroll even has Destroy All Monsters available for streaming, which featured Mothra, so folks have no excuse. That said, thanks to you and Inui (and that's a great blessing that no one was hurt and that he was able to make Mothra jokes instead!) for getting the Mothra song stuck in my head. Re: Sasuke World Cup: interesting. It will be better if TBS is in charge of it, since when they want to they can pull of coordinating something like this.